This board is intended to be a “run-time” substitute for the Arduino Uno. The general idea, is to develop a project on a fully functional Uno. Once the code (sketch) is complete and fully debugged, the programmed ATmega328, is then moved over to this substitute board, where it will, and any shields, and break-out boards, will reside, in the finalized project. A new ATmega328, with the boot loader, pre-loaded, can then be inserted in the “real” Uno, ready for the next project. The primary features of this substitute board, is that it is of the Uno form factor, with all holes and shield connectors, in the same physical location of a true Uno. All IO pins are connected to those 4 interfacing connectors, just like in a real Uno. The 2.1mm DC power jack, and the +5V regulator also are contained on this board. What’s missing is the USB connector, and the associated interface chip. Also this board does not have provisions for the 3.3V. AS02-Board – The PCB board itself, is sold as a bare board. AMI03 – Microphone input option parts. To route mic audio to input A0. ABL328 – Mega328 uC with Boot Loader. 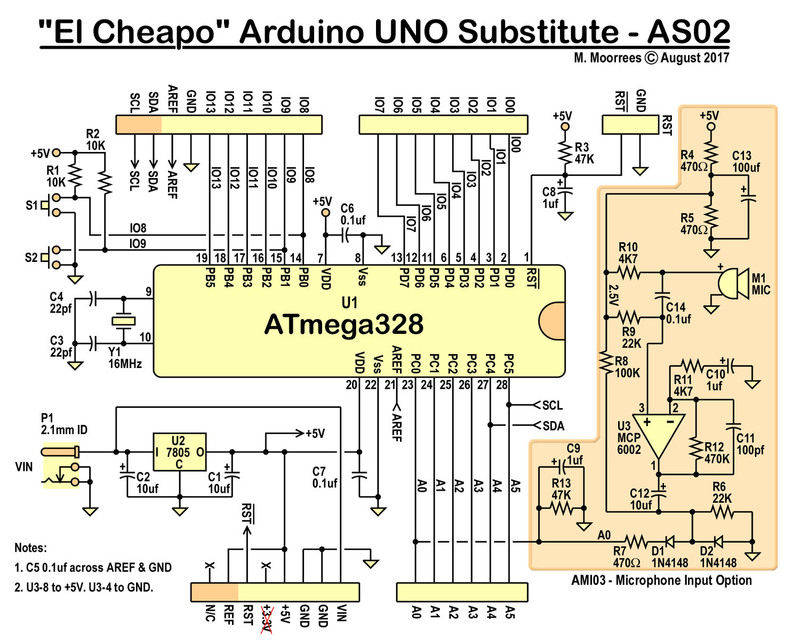 If you look at the schematic, you’ll see that this is the minimum necessary circuitry (omitting the microphone circuit), to substitute for an Uno. It is simply the 4 interfacing connectors, the 5V regulator, the Mega328 uC, with its 16MHz crystal and reset circuit. 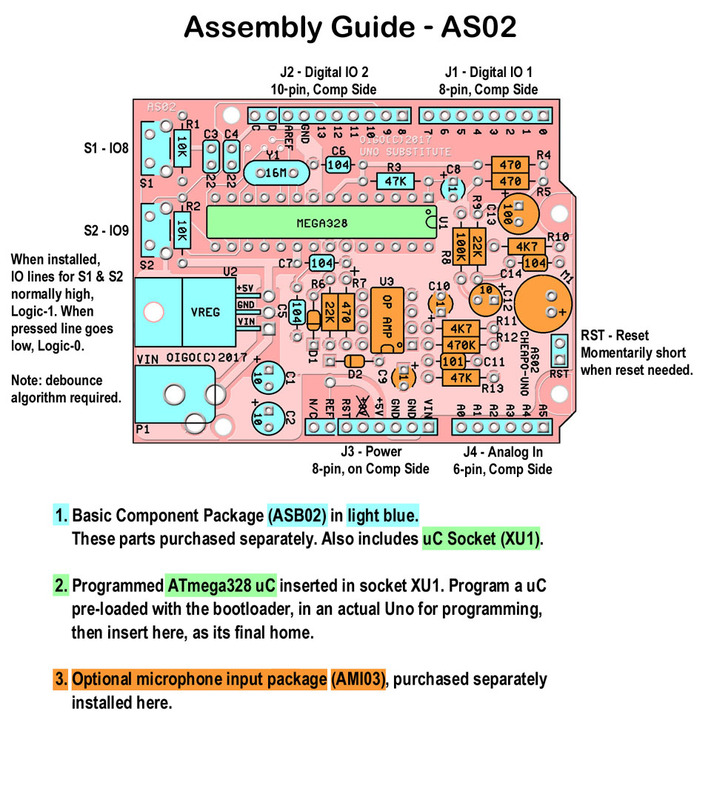 The ASB02 Basic Parts Kit contains all the parts NOT shown in the AMI03 Microphone option, and also does NOT contain the uC (U1). It does contain the 28-pin socket, for that IC. Parts for the AMI03 Microphone Option, are shown in the shaded area. This option, lets you route ambient sound, from the microphone to uC, by way of input A0. The audio is amplified, and processed thru a rail-to-rail op amp, which works happily with just +5V. Again, these 4 sub-assemblies can be purchased separately, so you only buy what you need. The components are very basic. 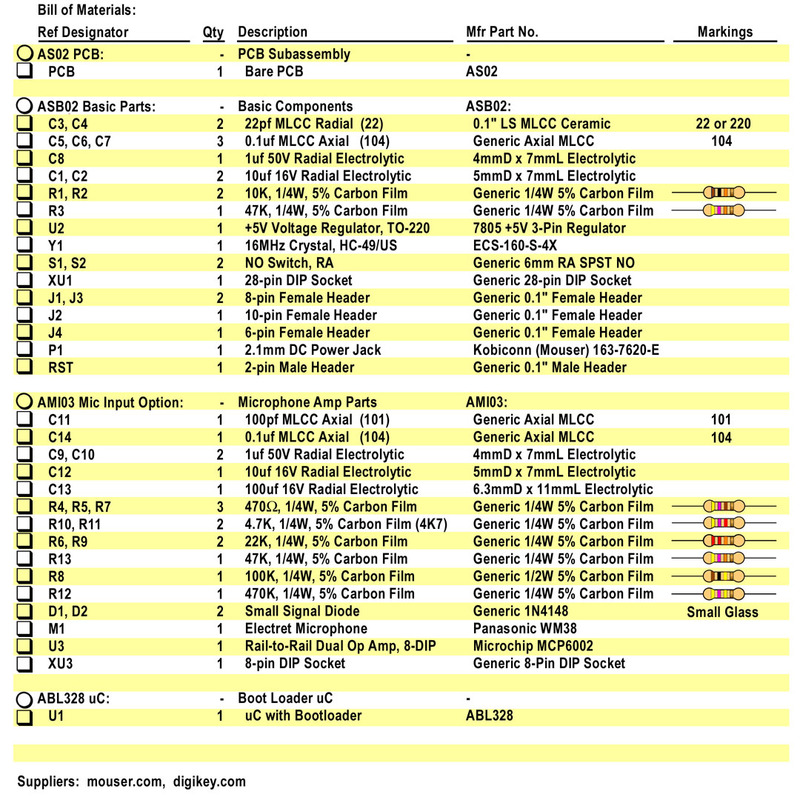 Even the ATmega328 with boot-loader can be purchased by several vendors elsewhere.